Karen qualified from Edinburgh in 1994 and immediately moved to Nottingham. Having worked in both NHS and Corporate practices over the years, she now divides her time between two Specialist practices; The Campbell Clinic in West Bridgford, Nottingham and Refine in Alfreton, Derbyshire. Her role in both practices is to provide NSPT for referred Perio patients, and both Pre-op and Maintenance for Implant patients. Six years ago Karen developed protocols based on Oral Hygiene and Risk for all patients undergoing implant treatments. Subsequently she was pleased to see the ADI Guidelines in managing Dental Implants and Peri-implant Diseases released in November 2012 reiterated her practice protocols. Through The Campbell Academy, Karen lectures to dentists on Implant Maintenance and runs her own courses for Hygienists and Therapists. 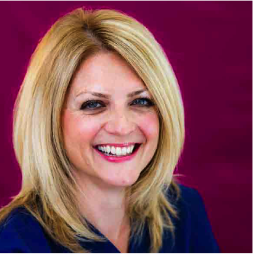 Karen has Speaker Status for the International Team for Implantology (ITI) and has spoken at their International Congress and regularly speaks at ITI study clubs. She is also a member of The Association of Dental Implantology (ADI) and spoke at their Members Forum in November 2013 on Implant Complications managed by the Dental Hygienist. She is due to lecture at the ADI Team Congress in May 2015. Karen was recently elected DCP Committee Representative for the ADI. In June 2013, Karen was delighted to attend the USTI in Berlin with Dentsply to become a ‘Cavitron Trainer’ and begin her journey as a Key Opinion Leader. Since then she has held ‘hands on” courses and study clubs for Hygienists and Therapists. Karen was invited to join the editorial advisory board of DH&T magazine, a magazine designed for Hygienists and Therapists. Karen is a supporter of Dentaid and travelled to Uganda in 2008 as a volunteer with a group of Dentists and Hygienists.